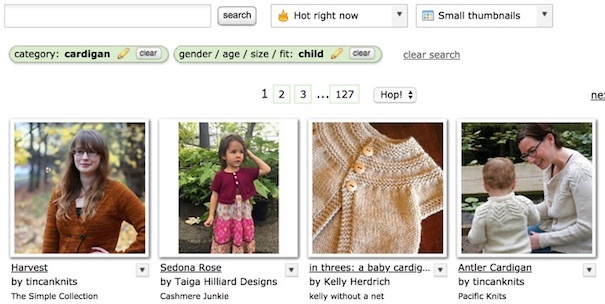 I love the Ravelry advanced search. I use it to find patterns to match my stash, plan my projects, and find beautiful inspiration. It took some time to learn the best way to find the results I am after, so today I am sharing my favorite tip to improve your results. Don’t use the search box. 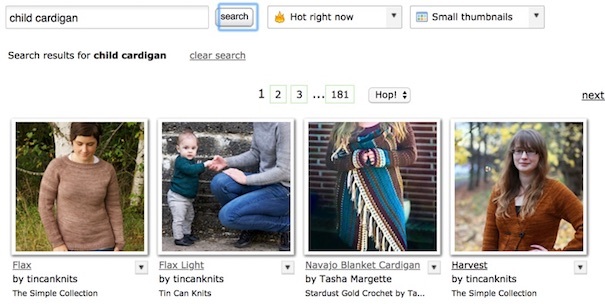 For most of the searches you want to do on Ravelry, using the filters to the side of the search is going to give you more targeted results that using the search box. Why? For patterns, the search box looks at pattern title, designer name, source name, and then the notes from linked projects. To search by the information that a designer has entered to describe their pattern you need to use the filters. Here’s a link to the search pictured above – using the search box to look for a child’s cardigan. Of the first four results, two of them are not written as cardigans and one has no child size written. They probably show up because someone has made a cardigan/child-sized version and wrote about it in their project notes. Here is a link to the search pictured above – using filters to look for a child’s cardigan. The first four results are now all cardigans and if you click to look at the patterns they all come in child sizes. There are a lot of filters available, and even I don’t know all of them off the top of my head. I try to peruse them as a drill down into a search, to remind myself of my options. When Should I Use the Search Box? There are a few cases where the search box is your best bet. If you know exactly the name of the pattern or designer you’re looking for, then the search box will pull it up. Things like holidays and characters are not attributes designers can add to their patterns, so if you want to find patterns related to a holiday tradition or a fandom the search box is excellent. I hope this helps to make your searches go more smoothly!